Summary: We reviewed bank surveys from Ovum and Promontory Interfinancial, and provide you with the highlights to consider during your strategic planning. 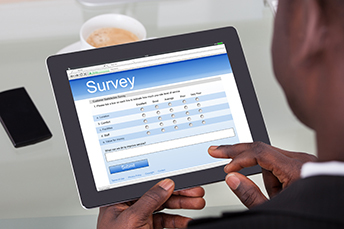 Survey teams are constantly quizzing small businesses in an effort to gain insight. A survey by Infusionsoft finds the top two digital marketing priorities for small businesses are driving sales (51%) and building brand awareness (48%). Maybe there is an angle here for community banks to help small business customers, particularly when you consider a whopping 62% of those businesses said they either don't know or did not think their marketing efforts were effective. As you think about the best way to target your small business clients for the rest of the year, we provide a discussion of the results from some other surveys - this time for banks. The first one comes from Ovum and is around payments. It finds bank executives say the top priorities pushing them to spend more around payments infrastructure are: security related to reduce the risk of fraud or financial crime and data loss; and to meet regulatory compliance and customer protection requirements. Continued efforts are likely for both this year and next, as most banks seem focused on them. Bankers were also asked whether they were planning to invest in various payment technologies. Here, the top areas cited were: AML (48%), card & account management systems (43%), payment hubs (43%), fraud detection & prevention (41%) and distributed ledger or blockchain technology (37%). Our final update around this same payments survey relates to the overall usage of payment cards. We bring this one up because it can sometimes be seen as the glue that binds payments to banks in some ways. Here, the survey found 78% of banks and 68% of merchants say the combination of instant payment systems and open banking will lead to a decline in the importance of payment cards over time. This seems to make sense at some level, so while it could take some time to occur, it may be worthwhile discussing during strategic planning, perhaps. Next, we explore some key things that surfaced from a Promontory Interfinancial Network survey of bankers on the industry at large. To start, the survey found that despite having overall positive views regarding where the economy is headed over the next 12 months, when it comes to access to capital, funding costs, loan demand and competition for deposits, bankers' confidence has hit its lowest point in the past 4Ys. Also, at the top of the list of concerns is Amazon's continued foray into banking territory, following the recent news that the online behemoth is working with JP Morgan to create an online checking account. Another significant finding of the survey was the shift that has taken place in where bankers believe they should be allocating their technology resources. The area where bankers are spending the most is processing/management/mining, with 28% reporting this as their top area of focus within technology, compared with 2017 when this priority was somewhere in the middle. The next highest technology focus is online banking, followed by information security and regulatory compliance. Surveys abound, so our advice is to read them when you can, but also stay focused on what is important to your specific bank. 1) Opportunity Bank of Montana ($814mm, MT) will acquire The State Bank of Townsend ($111mm, MT) for $19mm in stock (100%) or about 1.43x tangible book. 2) Busey Bank ($7.7B, IL) will acquire The Bank of Edwardsville ($1.8B, IL) for $304.9mm in cash (30%) and stock (70%) or about 1.64x tangible book. 3) MidWestOne Bank ($3.2B, IA) will acquire three bank holding company ATBancorp ($1.4B, IA) for $170.3mm in cash (20.4%) and stock (79.6%) or 1.55x tangible book. 4) The Farmers & Merchants State Bank ($1.1B, OH) will acquire Bank of Geneva ($287mm, IN) for $88.8mm in cash (10%) and stock (90%) or about 2.9x tangible book. California lawmakers rejected a bill that would have allowed the state to license private banks to process money from the cannabis industry. It was cited that the bill faced major challenges, including no protection from federal law enforcement. UPDATED: The SFR rental pilot program is not starting, but has been running for 2Ys and was just discontinued. The FHFA noted that the market is working fine without the liquidity of FNMA and FHLMC.